Blumberg, an only child, was raised by his mother in Atlanta following his parents’ divorce. His mother’s ancestors were Sephardic Jews. Expelled from Portugal, they moved to Holland and then to Curacao before settling in Providence, Rhode Island, in 1770. A generation later, the family moved to Charleston, S.C., and then to Georgia in the late 1800s. “A lot of my ancestors were in the clergy,” he says. “One of my great grandfathers came from Atlanta to Key West to be the rabbi in the 1920s.” Blumberg adds that he was taught to do my work without fanfare. “I was raised with an old-fashioned work ethic. As a child, I was mowing lawns, raking leaves, and delivering the Atlanta Journal after school. At 15 years old, Blumberg took a part-time job as a stock clerk at a shoe store in Lenox Square. After a salesperson quit, the manager asked Blumberg to fill in, and Blumberg soon became one of the store’s top sales associates. “I learned much about human nature in that shop,” says Blumberg. Blumberg continued to build his “people skills” as a college student at the University of Georgia, where he majored in psychology. He was also a door-to-door salesman selling coupon books with “two for one” offers. Intending to apply to graduate school in psychology, Blumberg took the LSAT to practice his test taking. “I remember opening the booklet and I immediately grasped the mindset of the questions,” he says. Receiving a very high LSAT score, he realized that his future lay in the law. After researching law schools, Blumberg decided on the College of William & Mary in Williamsburg, Virginia, the oldest law school in the United States with distinguished alumni like Thomas Jefferson and John Marshall. “The lawyer’s role as the protector of the lone individual was inculcated in every student,” Blumberg says. During college, Blumberg had visited Fort Lauderdale on spring break and found it to be a vibrant place. “I felt that South Florida was a relatively new area where opportunities were unlimited,” he says. Upon graduation, Blumberg moved to Miami and became a law clerk at the downtown law firm Knight, Peters, Hoeveler, Pickle, Niemoeller & Flynn. Upon passing the Bar, he was promoted to associate. As a new lawyer, Blumberg was trained by legendary trial attorneys, Cecyl Pickle, William Hoeveler, Jack Peters and Bill Flynn. 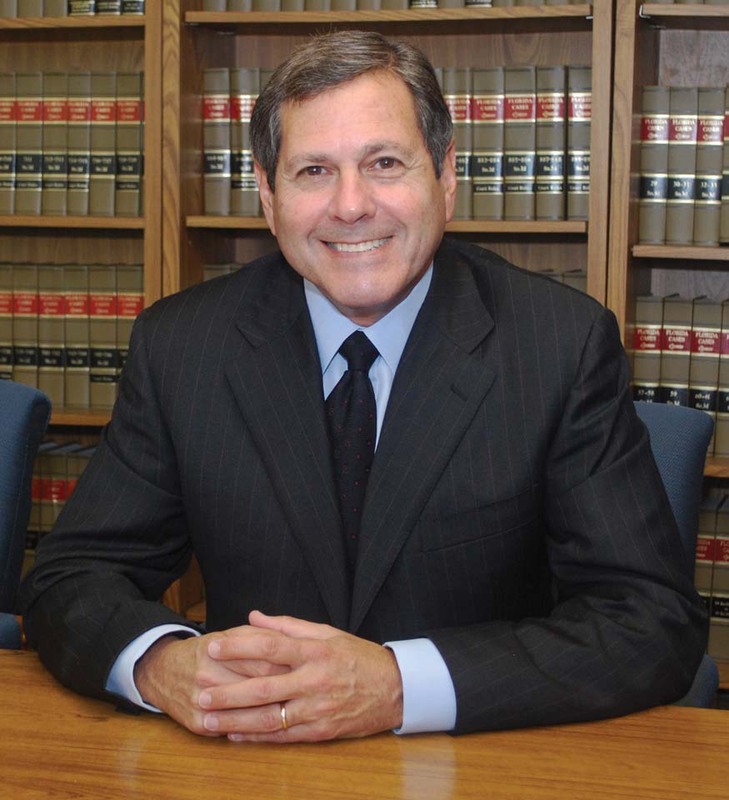 Before long, Blumberg was in the courtroom himself, defending big cases against top plaintiff lawyers. While Blumberg was successful in the courtroom, he began gravitating away from defense and toward the plaintiff’s side — especially after helping a paraplegic woman in a medical malpractice case against the Veterans Administration. Through the decades, Blumberg has represented countless catastrophically injured victims of medical malpractice, products liability, motor vehicle accidents, recreational accidents and other negligence-related matters. That includes the families of several deceased and seriously injured law enforcement officers. In addition to a busy trial practice, Blumberg has remained active in professional circles and as a lecturer. He has represented William & Mary as a lawyer and as an official delegate. He and his wife Iliana have two children, Beau, a third-year law student at the College of William and Mary School of Law, and Caroline, a graduate of Rollins College who is pursuing a master’s degree in electronic media at St. Thomas University. Blumberg credits his wife for the children’s success.